Diana is a veteran DC musician (Honky Tonk Confidential, The Fabulettes, and Tru Fax & the Insaniacs). She is a classically trained but also rockin’ guitarist, band leader, songwriter, and winner of an impressive number of Washington Area Music Awards (WAMMIES), including several for Album of the Year. She has performed at many venues including the Grand Ole Opry, the Kennedy Center, and the Smithsonian’s Museum of American History. Lisa, a singer with the Fabulettes and a professional actor, won a WAMMIE for her solo album “Sweet Bye & Bye,” and has also won several songwriting awards: “My Daily Bread” is a finalist in the 2018 Peace Song Awards, “I Paid Up” received an Honorable Mention in the Mid-Atlantic Song Contest in the Americana category, and “No Apology” received an Honorable Mention in the gospel/Christian/inspirational category. 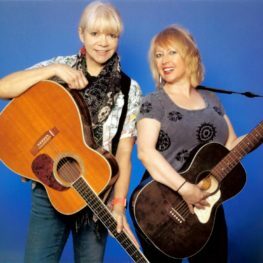 For this concert, the Snarky Sisterz will introduce you to some of their talented friends, including Maine Country Hall of Fame member Dana Flood on guitar and pedal steel, Joe Wainer on drums, and ——— on guitar and bass.